The following is a guest blog post written by Jürgen Schraten. Below, Schraten discusses his chapter in the recently published book, Economy for and Against Democracy. 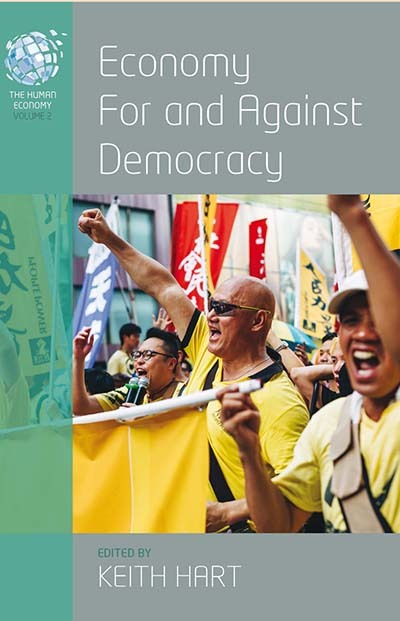 I wrote the first chapter of the book Economy For and Against Democracy, edited by Keith Hart and published this month by Berghahn Books – you can buy the book here with a 50% discount until 20 December; use the code HAR449. The chapter is titled “Habits of austerity: financialisation and new ways of dealing with money”. As the title suggests, it focuses on the financialisation of everyday life in South Africa within the global context of the concomitant expansion of financialised markets and government austerity policies. “Financialisation” refers to a form of capitalism that is no longer primarily focussed on production and consumption, but on the earning of money with money. Of course, this is nothing new in capitalism. However, for a long time this kind of business was supplementary to industrial capitalism. This changed from the 1970s on, and the chapter highlights some crucial features of this story. In the political arena, it boils down to governments’ willingness to fight inflation at the cost of unemployment. The rather abstract idea of “fiscal discipline” was given priority over the palpable requirement of income generation for the wider population. What still puzzles me is the unabated success of political demands that protected the earning prospects of big capital, which can only be enforced at the expense of low-income earners and the unemployed. It is an economic ideology that claims to represent a pure kind of rationality, well exemplified in its most extreme form by Margaret Thatcher’s famous slogan “there is no alternative”. Without any empirical basis, it promises to produce wealth for everybody through the creation of employment and trickle-down effects magically brought about by competitive markets. The guiding question of the chapter is: why are people still willing to participate in such an economy, and vote for the proponents of these views in almost every election? Parallel to the spread of austerity policies, many products, practices and norms that originated from financial markets have rapidly conquered the daily life of ordinary citizens. Citizens in the centres of capitalism are now both lenders and borrowers. The current financial system sees no contradiction in financing one’s own retirement scheme by lending money to investment companies, while at the same time taking out a loan for buying a car or home furniture. If you add to the picture insurance policies, student loans, medical payment plans, and a bunch of credit cards, it is clear that people have become deeply entangled in the world of finance. The free availability of consumer credit, no longer impeded by moral deprecations of “usury” and “living beyond one’s means”, is a key sign of financialisation. South Africa is no exception to this, although the reasons for it are not so obvious. Of course, a population suffering from unemployment, low and unstable income flows represents a worthwhile target for the consumer credit industry. Yet, the South African context is marked by the widespread presence of communal economic relations, which come with a certain degree of social control. Traditional figures like loan sharks make a killing here, and informal saving schemes like stokvels remain very popular. Financialisation, on the contrary, depends on complex institutional arrangements which tend to shift all or most of the risks on debtors and disproportionately favour creditors. It is also made more individual through the use of data processing, and information and communication technology. According to economic historian Karl Polanyi, every time free markets extend their reach over human domains previously regulated by non-market rules, society reacts with a “counter-movement” that attempts to mitigate or neutralise the extension of markets. In the South African case, the apparent freedom inherent in making loans accessible to the wider populace comes with strict legal procedures to protect creditors from the threat of debtors’ default – the National Credit Act of 2005 is the most relevant piece of legislation in this respect. The extension of institutional controls trap debtors in the hands of consumer credit agencies and banks. The latter allure people with the promise of an autonomously managed future, in which human beings become the architects of their own fortune. At the same time, failure is common and expected. “Take out a loan and try your luck”, the system says. But the truth is that the consumer credit industry earns most from defaulting debtors. In contrast to traditional money lenders, banks are not scared of losses because customers are entangled in their web and cannot escape their reach. They, or their relatives, will earn some money sometime somewhere – and then the banks will be after them. Money, increasingly reduced to a flow of information in a digital network, is indeed going to inform them. This is not a wholesale indictment of the financialised economy. Consumer credit does offer opportunities for economic emancipation. It allows people without inherited wealth to get on their own feet. It can contribute to a human economy that benefits people rather than banks. The problem lies with the political and legal framework that regulates the industry. As things stand in South Africa, only money lenders gain from this system. Alternatives should focus on a fair distribution of risks among lenders and debtors, and the principle that society should take up the costs for those who tried but failed. It requires some political will, and experimenting with fairer economies. Jürgen Schraten is a postdoctoral research assistant in the Department of Sociology, University of Giessen, and a research associate of the Human Economy Programme, University of Pretoria.